When it comes to choosing gears for backpacking, you undoubtedly have many decisions to make. However, the most important decision involves choosing the right backpacking footwear. Let alone backpacking, even simple strolls can become a nightmarish experience with the wrong footwear. In fact, a bad boot choice can lead to uneasiness, serious injury on the way and thus, it can ruin your excursion altogether. So how can you get the perfect pair of shoes for backpacking? How often do you backpack and research foot wares which are ideal for your intended usage. Take some time to select the right boot for you. Try some footwear before you decide on any one of them. Walk around the store and minutely note how they feel. If possible, try walking with a loaded rucksack. P.S: However, while you are hiking, you can wear the socks you normally wear. From traditional boots to light flip-flops, the modern market is flooded with several footwear options which can suit you and your backpacking style. Though the traditionalists prefer wearing hiking boots during excursion, an ill-fitted boot can be the key to a ruined backpacking trip. Finding a really good, comfortable pair of boots is not very easy either. However, the heavy hiking boots are ideal for excursions in cold places and rugged terrain. 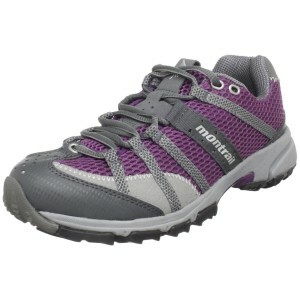 Of late, Trail shoes have become a popular choice among numerous backpacking enthusiasts. These lighter footwear help to increase your agility. Besides, the flexible uppers of the trail shoes guard your feet better. Even sandals have gained much popularity as backpacking footwear. However, hiking sandals are especially designed with toe caps that shield against rock kicking. Moreover, the lugged soles allow for a better grip. Toed shoes are the latest version of backpacking footwear. These “barefoot shoes” have individual compartments for each toe. Backpacking enthusiasts appreciate the fact that these toes are not confined, and they are extremely flexible. You can have your own choice of shoes for backpacking. However, before you decide on a pair of shoes, make sure that you do a thorough research on the footwear that catches your fancy. The market is flooded with many hiking footwear choices, both for men and women. 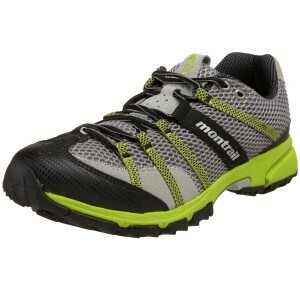 Among them, the Montrail Women’s Mountain Masochist Trail Running Shoe has received rave reviews from its users. The shoes are made from synthetic materials and mesh. The digging lugs of the shoes provide better grip on loose surfaces such as mud and gravel. It is available in many attractive colors. It is available in many size options. The product gains a near perfect rating of 4.9 out of 5 stars at Amazon.com. It is here that you can have these shoes at a discounted rate. Men can love the Montrail Men’s Mountain Masochist Trail Running Shoe which has been hailed as a top selling performance trail runner. They are made from mesh and synthetic materials. The breathable, light and wicking mesh upper with webbing straps allow for comfortable fit. The Gryptonite outsole offers superb trail traction. The unit gains a very high rating of 4.3 out of 5 stars at Amazon.com. Most of the consumers agree that the shoes fit well, they are breathable and supportive. You can learn more good things about this shoe model at Amazon.com. So, are you ready to choose your own hiking shoe now?